A building stone that easily splits into smooth, flat pieces. Slate can be brittle, and may sometimes chip, when it's not protected. 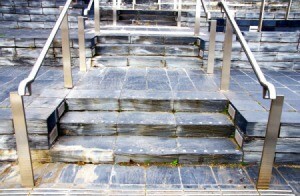 This is a guide about repairing slate steps. My slate front steps are flaking and I want to know if there is a product that will protect the slate. The slate steps at the front door of my church are breaking off in pieces where the steel hanrails are attached. Short of cutting the stone and pouring cement in its place, is there any way to repair the joints or reattach the railings to the slate? Go to a home improvement store and buy a clear sealer. There are several to choose. But any any sealer made to seal concrete will do. You can apply it it with a roller. I have a slate patio on my house and slate steps in my front and back yard. The slate has been coming loose from what I believe is the concrete beneath them. I have tried repairing them with masonry compound and even gorilla glue. The masonry compound did not work at all, the gorilla glue worked temporarily. 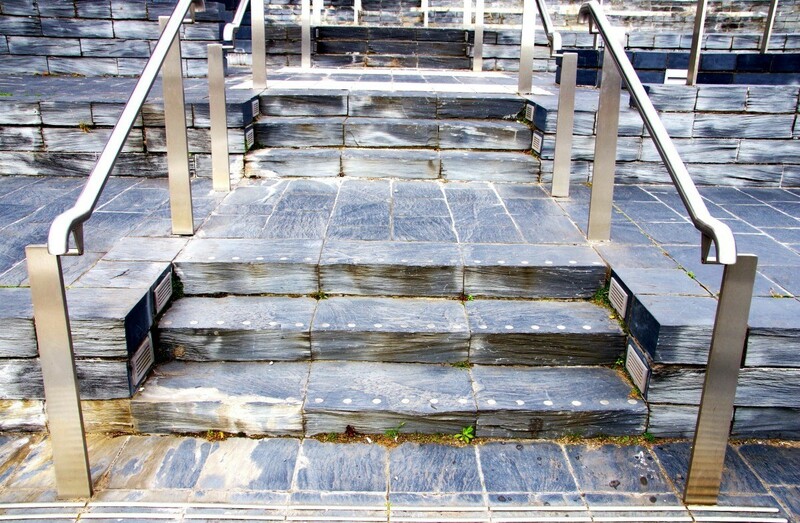 Slate is not strong enough to safely support railings and the reasonable use and abuse you have to expect. The leverages involved are way too high for anything that fragile, and you may have some building code violations there, which could invalidate your insurance. Patch the cracks with liquid stone, a rock-dust filled epoxy, and move the railing supports to just beside the steps. The cheapest fix usually is to drive 1 inch galvanized pipes 3-4 feet into the ground and welding the railing stanchions to them. When patching the stone, make sure it is warm through and through, otherwise you are wasting expensive epoxy.